Bartek Ciszewski: How did you come up with an idea for Helpr? Peter John: We didn't have any background in social care market. We made our careers in technology and financial sector. These were our private experiences that showed us the system should be changed. We saw the lack of quality care available in the UK. Both Steve and I had problems finding such service for our families. We noticed that the system is not efficient, and we could apply technology to make it better. Currently, care workers in the UK are underpaid, and labour turnover is a huge problem. Private individuals are charged a lot of money for care services, and the profit goes to agent and local authorities, while care workers are on minimum wages. Bartek: How does Helpr change it? Peter: In Helpr, care workers are our partners. We put them at the very center of our platform. Well paid and well trained people are naturally much more motivated. Only this way we can increase the supply of the care services and balance the market. The first step was to take out the agents, who profit the most from the system. As a result, our care partners earn up to 66% more than they would otherwise. 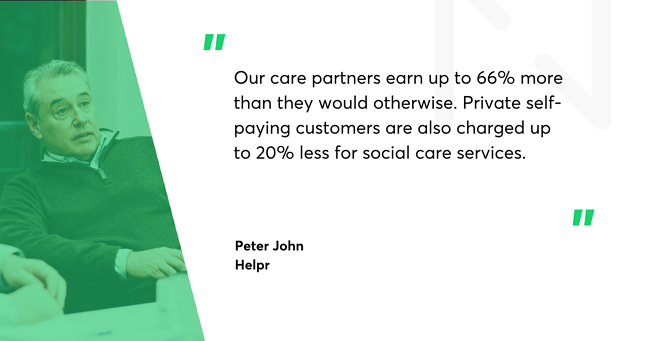 Private self-paying customers are also charged up to 20% less for social care services. Additionally, care workers get flexible working hours, since they plan their own schedule. We provide training, and workers may claim travel fees, uniform cost, and more. Work hour flexibility proved to be crucial to engage more people in social care, such as retired social care workers, newcomers, or young mothers. We provide the training online. In the UK there's a official Care Certificate that guarantees worker's skills. We have partnered with the only company in the country credited to give Care Certificate courses online. We provide this service to all our care partners as a perk for joining our platform. Bartek: What were the main challenges when building such a platform? Peter: Social service is a complex market, and not having a background in it, meant having to learn a lot. Each local council works differently, while the agencies sell the services to private sector in their own way. The biggest challenge was keeping tabs on multitude of care partners in various locations. Additionally we needed to provide transparency for the service purchasers (often son and daughters of the people being taken care of). They need access to the care plans and diaries. Bartek: How does your app work in practice? Peter: A care partner starts his or her commute in the morning. Gets to the car, and the app is already working measuring the distance, so they can claim the costs back. Helpr provides the information when a care partner walks into the client's house. The whole process is very transparent. This is something that is very needed in the social care market. When a care partner writes a note in an exercise book, we store it online, and it's accessible for everyone involved. The app also provides a system of alerts. If a partner can't get into the house, normally they have to phone the agency, until they connect with the right person. 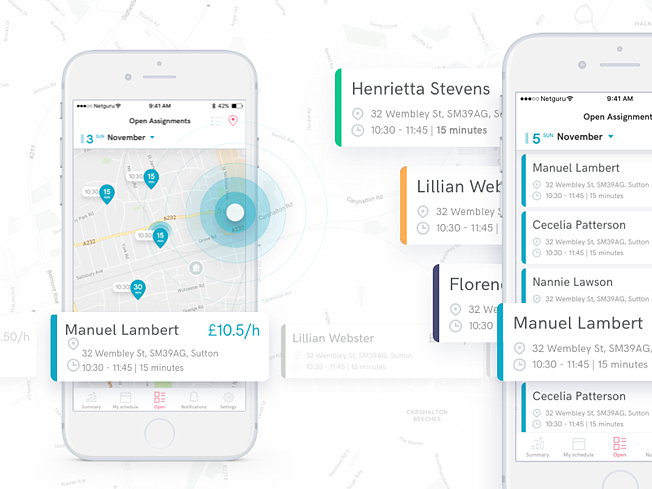 Helpr app sends real-time automatic alerts to all interested parties. Finally, the payments are handled through our systems. As you can see, there were quite a few technical challenges in this project. Bartek: How did you choose Netguru for your development team? Steve Dailey: We've got long history in tech project and program managing, and we know the market very well. We thought UK based companies were going to be too expensive. I have quite a long experience working with remote teams, and worked with complete offshore (i.e. companies from India) and nearshore (i.e. Spain and Poland), so I knew what to look for. We reduced a list of 20 companies down to 4. There was one from the UK (a front for an Indian outfit), a Romanian company who wanted to bring the development team to London, one from Lithuania, who made a good impression but their culture and language skills were problematic, and finally Netguru. We did a scoping exercise. I liked the team's language skills, they seemed to be easy with which to work and partner. Netguru had pretty good references which underlined reliability and precise budget delivery. Transparency was a big issue for us and we liked that about Netguru. You were open to inviting us to your office, and we were very keen to visit. We liked your openness, because we wanted to be hands on the project. Bartek: How did it go? Steve: We did the scoping session in July, made the decision and started the project in August, and will complete phase one next week. The project is moving really fast. We have an MVP coming to market in just 5 months, and it's not a simple product. 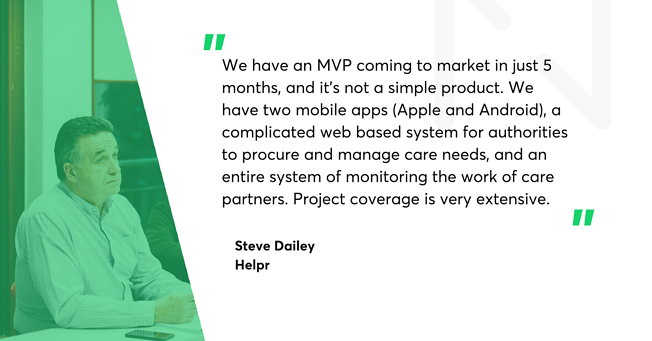 We have two mobile apps (Apple and Android), a complicated web based system for authorities to procure and manage care needs, and an entire system of monitoring the work of care partners. Project coverage is very extensive. We are looking to work with a number of local authorities since January. That's the time when we get the fist feedback. Bartek: What's Helpr's business model? Peter: We're not an agency. In the UK, the provision of social care is regulated. Helpr is an "introductory platform”, which connects both ends of the market. We act as a social enterprise, with a business model that puts our care partners and clients first. We have to make profit, but it's not our priority. This way we can focus on maximizing the quality. Bartek: How did you like working with Netguru? Steve: You've met our expectations. The team is very open and very friendly, and have quite an outstanding level of English. I judge this from their ability to understand jokes, Netguru team have no problem with this. I find language comprehension important when working remotely, where good communication is crucial. I was also impressed with how quickly people in Netguru are briefed. Onboarding is very precise. There were few changes of people working on Helpr, but it was unnoticed. We started with one designer, who later was joined by a backend developer and a frontend developer. When the web app was ready, they were joined by iOS and Android devs. I remember a weekly call with nine Netguru team members because of the rotation. But because of precise onboarding, team member rotation was never an issue. Peter: You provided us with a great technical competency. We've had a great designer, great developers (backend and frontend), and the quality of testing has been surprising. Testing is normally a big burden, but we've been impressed with the quality of it. We do testing on our own as well, and low level of bugs is reassuring. Steve: Working with Netguru's processes has been interesting. We've been very hands on, and like the organization of daily Slack communications, weekly calls, project management in Jira, where I could see bugs, sprints, and what tasks were pushed to next week. We have visited Poznań 3 times over 5 months. We met for the first time for scoping workshops, had one meeting halfway through the project to discuss problems, and one big meeting to review the first phase, and plan the second part of the project. Bartek: Any advice for people looking for remote dev teams? Steve: Language skills should be your priority. When working remotely, teams should not only be fluent, but also comprehend. They should provide you with full transparency, use tools to allow you to understand what's going on, and what are the people involved in your project are doing at any time. This also means, that when problems hit, you are advised ahead of it. A transparent company will not rob you from the ability to manage a problem by withholding the information. Finally, you should have the feeling you can get on well. Personal visits are important, too. I think a personal visit every 3 to 5 months is a minimum. You can have openness and trust only if you meet face-to-face, and get on well with your remote team. Peter: When we engaged 20 different software development companies, we were looking for an organization with the right culture - a mix of language skills, tools, tech capability and transparency. Netguru proved to be the right choice. At the scoping session, you were the first to tell us about a potential problems, suggested rethinking the plan, and taking a functionality out of the scope. We were happy to do it. Sometimes we decided to introduce more resources, which they gladly did. Flagging issues very early on, allowed us to make critical decisions for the project. view the project's presentation on Behance.